Nederland is a small town and parking is limited; please help by carpooling or taking the bus. A shuttle provided by Bus To Show will run to Nederland from Denver and Boulder during the Festival. It’s a safe and fun way to enjoy the festival! Click here to reserve your spot on the party bus! Catch the N Bus from Boulder to Nederland. There is a HUGE parking lot at 6th and Canyon in Boulder next to the Justice center and a bus stop across the street. Go to the RTD website for info on routes and schedules for the front range. FROM BOULDER: Take Canyon Drive (HWY 119) 17 miles West (up) to Nederland. FROM WESTBOUND I-70: Take I-25 North to HWY 36 (Boulder Turnpike) and follow it into Boulder. Turn Left on Canyon Drive (HWY 119) and go 17 miles West (up) to Nederland. FROM EASTBOUND I-70: Take Exit 244 (Route 6) to HWY119 and turn left (North). Follow that through Blackhawk/Central City, down past Rollinsville and on into Nederland. You will be directed to parking once you reach Nederland. Parking is first come, first served. 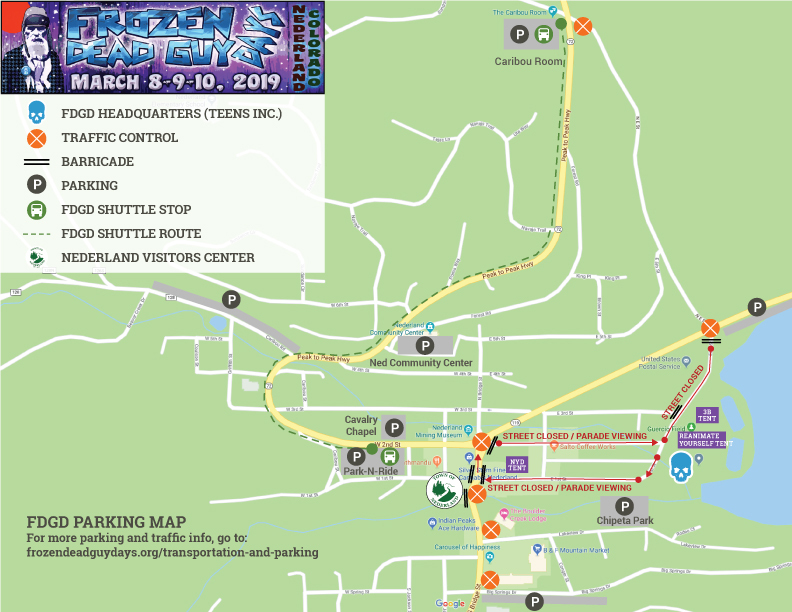 There is parking along Boulder Canyon Drive as you approach town from the east, along Big Springs Drive as you approach town from the south, and on Caribou Road, just to the west of town off the Peak to Peak Highway. All street parking is one side only, and you must pull all the way off Boulder Canyon Drive or you will be ticketed/towed. Please be mindful when parking on the street and DO NOT park in front of driveways. Nederland is a very small town so please plan on parking once and not re-parking to keep traffic down. Everything is walkable. DO NOT park where is say “No Parking.” You may be ticketed and/or towed.